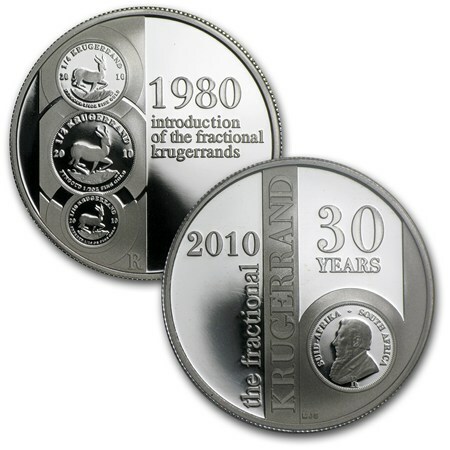 This special edition set as issued by the South African Mint was released during 2010 as a 'Fractional Set' with four of the fractional sizes of the classic gold Proof Krugerrand, to commemorate 30 years of production of the fractional sizes of Krugerrand. The set includes 1/2oz, 1/4oz & 1/10th oz Gold Proof coins, and a 1/2oz Silver Proof Medallion designed to commemorate the 30th Anniversary of production. The 2010 Fractional Set is limited to just 500 certificated sets, and each coin is encapsulated and held in an internal red velvet display case to enable you to proudly display this superb set. 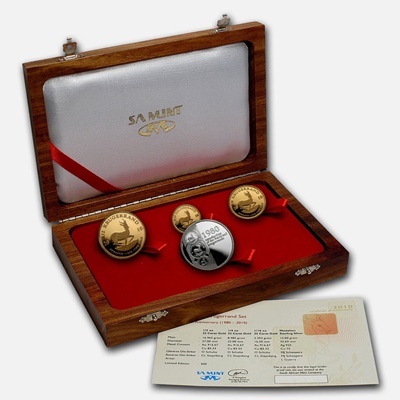 The coin set is housed in the original issue embossed wooden case and the certificate of authenticity from the South African Mint.